Back in March, I volunteered with Give Kids the World Village for my Spring break. Give Kids the World Village provides weeklong, cost-free vacations to children with life-threatening illnesses and their families where the families go to themeparks in the Orlando area. Children and their families are provided with accommodations in fully-furnished villas, transportation, tickets to theme parks, meals, daily entertainment, and more. 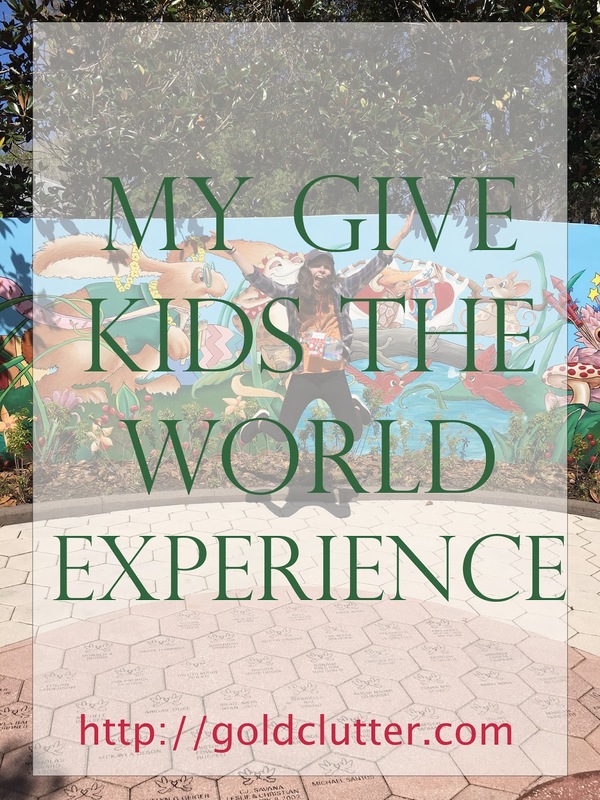 You can learn more about Give Kids the World here. I was fortunate enough to volunteer at Give Kids the World Village for a week. Immediately after looking through the website, I knew I had to volunteer soon. Luckily enough, my wish of volunteering came true. I spent a week watching smiles take up kids faces. In the week I spent at Give Kids the World, I assisted with lunch, cleaned the dining room, helped with a party, and helped bring smiles to the kids faces. While there, I got to meet some of the most remarkable families with the most resilient/strong kids I've ever met. It was truly transformable to see how bright and positive the kids were. The kids would around with a huge grin spread across their face as they greeted me and the other volunteers with a big, friendly hello. One of the magical things about the week was seeing all the volunteers. I got to meet people from Emory, Georgia Tech, and UGA in a span of a few hours. Later that day, I met a group of high schoolers who were spending 2 weeks volunteering. I also met locals who spend their days and nights volunteering in order to make sure the kids and their families experiences are incredible. The most amazing of them all is the staff who do so much in order to ensure the kids have a magnificent time. No matter what they're doing, they always go above the extra mile to help make the day a blast. I truly recommend that you volunteer at Give Kids the World Village. It is truly a life changing opportunity. I'm forever grateful to have spent the time I did volunteering, and hope to come back in the future. Please donate if you can to the wonderful organization here or learn more about volunteering here. This is a recap from April. The month where I was gone from Gold Clutter. I kept busy doing other things beside blogging. My school had our musical, and I hosted an exchange student from France. Well, here's a look at April. The week leading up to the musical was a whirlwind. I lived and breathed theater. We stayed after school until 8 o'clock everyday practicing for the musical. It was tons of fun getting to hang out with the cast and crew during downtime. Thursday night was opening night AKA my favorite night. The feeling of excitement backstage was contagious. Everyone was excited to show off all that we'd done for the past 2.5 months. The show was incredible. The whole weekend was amazing. I especially loved theater dinners after the musical. We went to Waffle House and Taco Mac. It was great to talk to my friends after the show. We were all so hungry by the time we ate. We'd eat dinner at 10:00. Sunday was the Senior ceremony. It was so sweet. The Juniors get goofy gifts for the seniors. 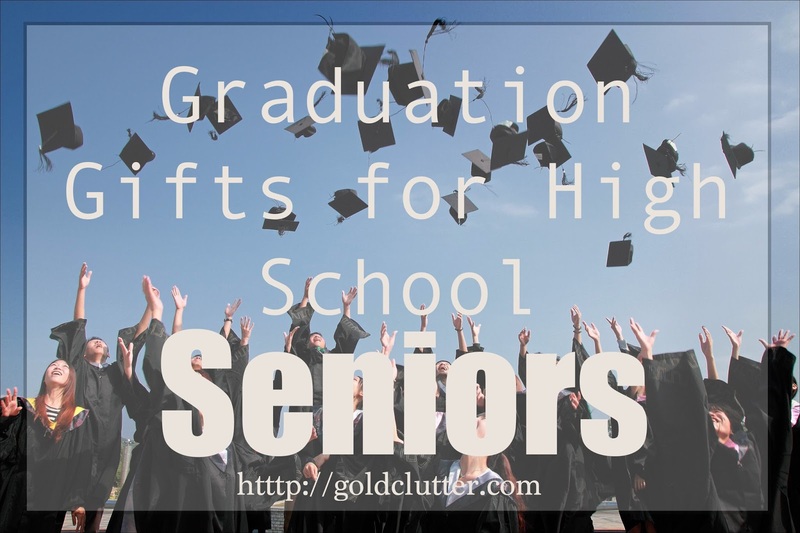 Then, the juniors present the gifts to the seniors and talk about them one by one. Teachers in the theater department talk about the Seniors. I loved hearing what the Juniors and teachers had to say about the Seniors. I was so sad during it. I don't want the seniors to leave. They're the best. My French exchange student, Aglaé, got to Atlanta on Friday, but I didn't get to meet her until Sunday afternoon. It was surreal to meet her after emailing back and forth since October. I loved that she was able to see the musical. I didn't get to spend much time with her on Sunday as I had to help with strike. Strike for costuming went by really fast. We just took everything off hangers and sorted it by color. I was so glad that it didn't take too long, since I was really tired from the whirlwind weekend. Aglaé shadowed me in school on Monday. She got to meet all my teachers and friends. It was interesting to learn what's different in French schools versus American schools. She liked my school, so I was happy. We took Aglaé to Steak and Shake on Monday night. My mom wanted her to experience the true fast food experience. She loved the hat they gave her. Aglaé got a burger that night. She ate a ton of burgers while she was here. Tuesday was a busy day. Aglaé taught the French classes for the first half of the day. After, she headed to Lenox to do some shopping. I had to stay in class but I heard it was a great time. To make the day even better, we went to a Hawks game. The Hawks played the Hornets that night. We we're lucky enough to go on the court. We got to high five the players as they went out onto the court. The whole night was so exciting. 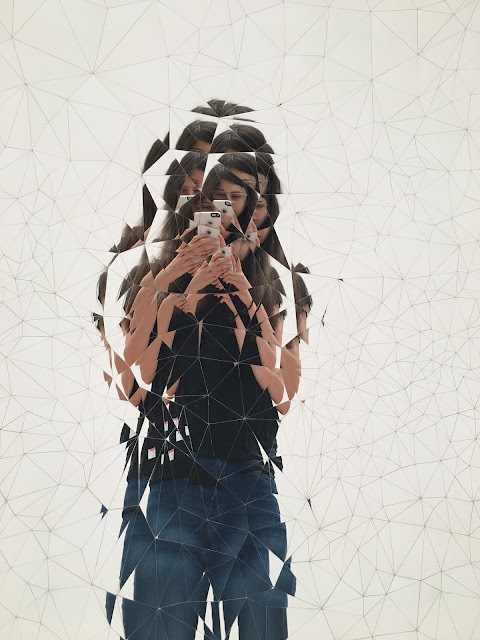 On Wednesday, Aglaé explored Atlanta. 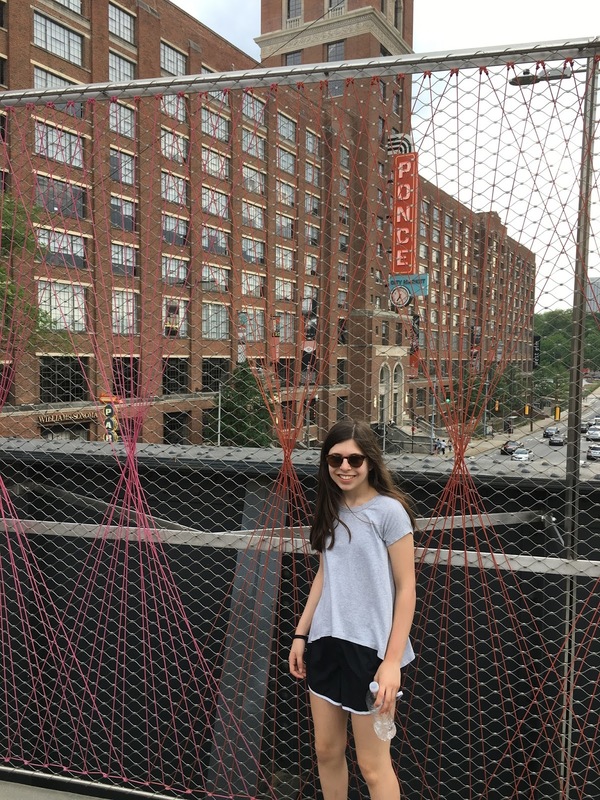 She went to Coke's headquarters where she got a behind the scenes look, World of Coke, and Ponce City Market. After that, we went to theater. For the first part of the afternoon, we had a guest speaker. He was a playwright from New York. It was interesting to learn what its like to write plays for a living. To celebrate the end of the musical, all of tech went to dinner after. It was a great time chatting with all my fellow techies. 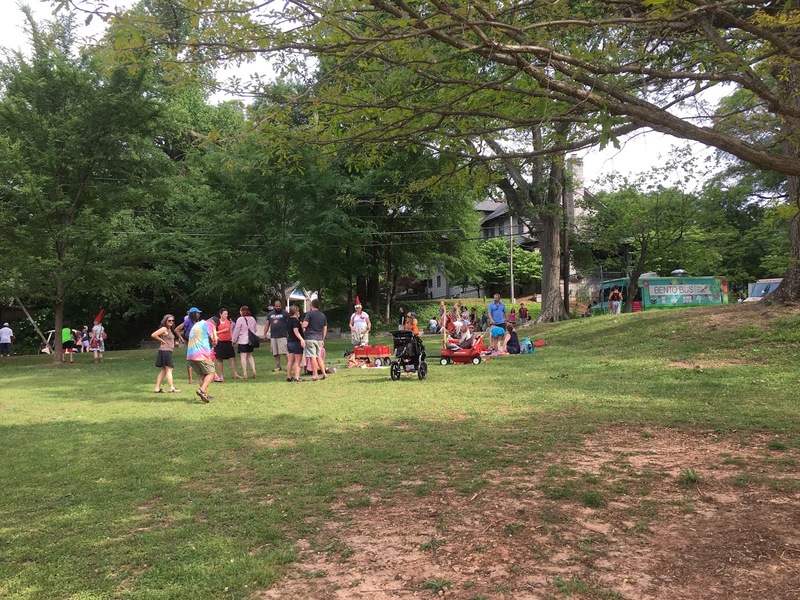 Thursday through Saturday were spent on a segway tour of East Atlanta, canoed the Chattahoochee, went to the aquarium, and chilled at home. The segway tour was tons of fun. It was pretty funny to see a group of 10 riding on segways through traffic. Sunday was a casual day. We hung out at the house dying eggs, made slime, made rolled ice cream, and thank you notes for our teachers. My sister taught Aglaé how to make slime. They made ridiculous amount. We attempted to make rolled ice cream but it didn't work out. :( Lastly, we hung out in Enos as a nice way to end off the day. Monday was Aglaé's last day. We let her sleep in really late to help with the jet lag. After all her stuff was packed, we headed out for one last adventure. Cinnaholic was our final stop on our tour of Atlanta. Aglaé got cookie dough while I got a cinnamon roll. Needless to say, we both loved the food. My French teacher took Aglaé to the airport but before that we had a farewell party. Aglaé got a t-shirt that all the American kids could sign. After everyone was done signing t-shirts, we watched a slideshow of everything we did throughout the week. It was absolutely adorable. I hated saying goodbye to Aglaé. Hopefully, I'll get to see her again soon. We didn't have theater the week after the musical, so we had a lot of catch up work to do. That whole week, we worked on organizing the costume shop, laundry, washing the costumes from the musical, and putting them away. We still have a lot of work to do before the end of the year. In a few weeks, we have a dance show. After that, we're done costuming, and just have to clean and organize. Wednesday night I went to states and installs for BBYO. It was incredibly sad to watch the N'siah and Godol of Atlanta Council give their states. As usual, they did a terrific job. The new board is going to have to live up to high standards. To end the night, I got an award. My love for BBYO is through the roof. I spent the weekend volunteering. We had a fundraiser that we sold raffle tickets for. Last year, we raised over $2,500 from the fundraiser. Sunday, was a volunteer event. We we're supposed to have a Spring festival. It rained the entire day so most people thought it was cancelled. It was just moved inside the building. Only 25 people showed up when we we're expecting 300. For my Biology class, we do a year long research project. On Tuesday, we presented our projects to anyone who wanted to come. My project was on the health effects of the vegan diet. I decided to get cinnamon rolls to present with my project. They were a smashing success. That's a wrap on the last three weeks. Once again, sorry for not posting. I hate that I went so long not blogging. I definitely kept busy, though. Graduation ceremonies are well under way. This year, will be my 6th time going to a graduation ceremony. I love them so much. They're so sappy with all the speeches. They make me so happy. Anyways, year after year the girls wear wedges. You get the height of heels with some of the comfort of flats. They're the best of both worlds. 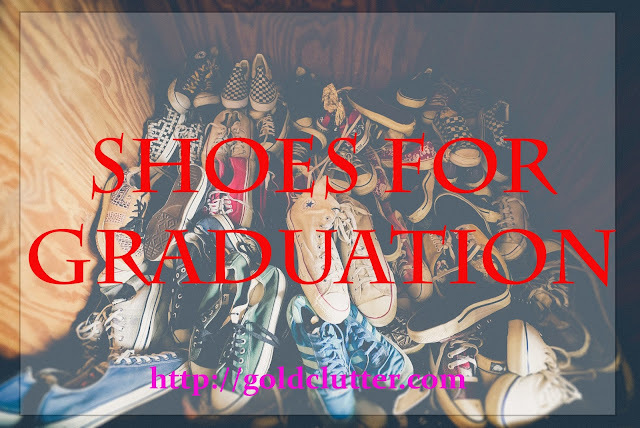 I gathered up my 10 picks for wedges for graduation. These shoes are the cutest. I'm really into the espadrilles trend. They look chic no matter how you wear them. I might have to get a pair for myself. The OTBT wedges have been the it shoes for high school and college students the pat few years. I have a pair similar to them, and they're so comfortable. 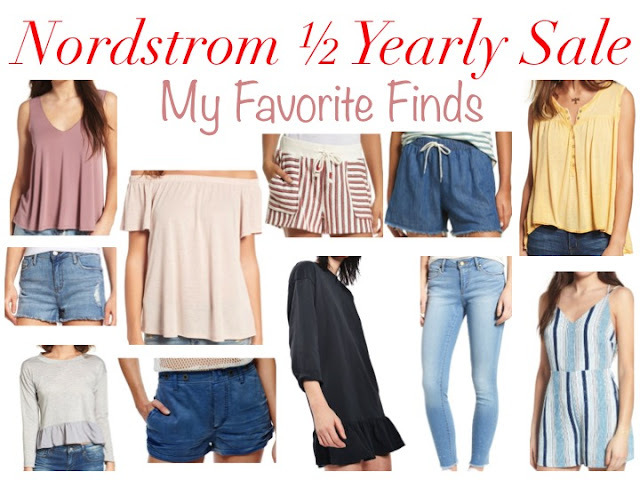 I definitely reccomend them if you have to stand around for a long time. I normally trip in wedges, but those shoes haven't caused such a problem. The pink wrap around wood-esque wedges are adorable. I saw someone on them recently, and loved them. Which wedges are your favorite? What are you wearing to graduation?